Being a true account of Adventure, Avarice, Inquisition, Evisceration, and Peril on the Spanish Main. Of desperate men on Blood dimmed Shores, the Lure of Gold and the spoils of Whores. Savage Cannibals, Epic Crossings, Brutality, Honor, and heroic Resolve. The first of the great Caribbean pirates whose life was a dread Portent of the Wild Age to come. The first Caribbean pirate to achieve widespread infamy came from a port town on the Atlantic coast of France called Les Sables d'Ollone, and the name history bestowed on him as inspired by that place; Francois L'Ollonais. He arrived in the Caribbean as a youth indentured for several years, then made his way to Hispaniola where he hunted the wild beasts of that island among the Buccaneers. The Spanish sought to purge the Buccaneers through constant raids and harassment and it's likely they routed L'Ollonais from there, for he soon afterward came to Tortuga and began his robberies of their vessels and demonstrated a single hatred for them. At Tortuga, L'Ollonais began assembling a fleet and announced his attention to raid towns and fishing villages in the Spanish dominions and return to Maracaibo to pillage the entire city. His reputation at this time was enough to lure many to his cause; sailors and fighters, destitute and desperate men, rogues of petty greed who looked no further than their next vice's slaking, and dreamers of majestic avarice who saw glory and fortune to be made. 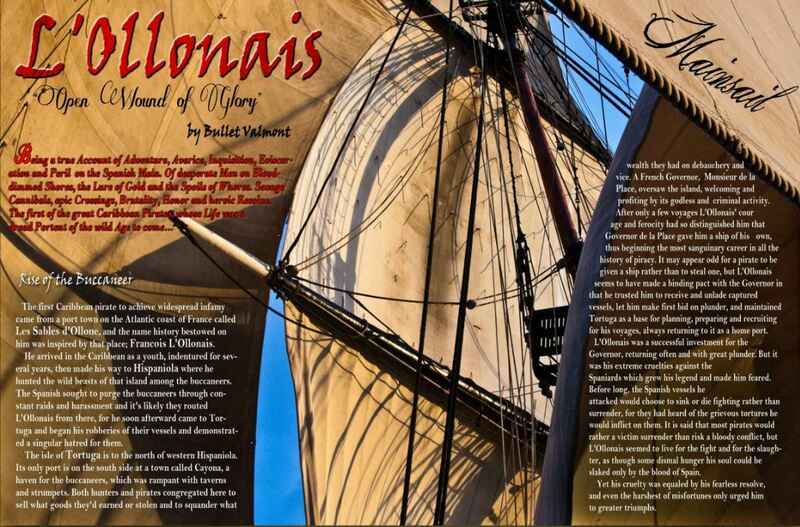 Whatever miscreant aspiration compelled them, they say in L'Ollonais the vessel its deliverance and, on faith, they followed him..
Late in April 1667, they embarked from Tortuga in eight vessels, stopping first at Bayala on the north side of Hispaniola, where they armed and victualed for the voyage, and recruited many of the buccaneer hunters to join them. Resuming on the last day of July, they encountered a Spanish ship of 16 guys which L'Olonais decided to take himself, sending the rest of the fleet to the Isle of Savona where he intended to rendezvous with them afterward. To his surprise, the Spaniards (apparently aware of who to stalked them) choose to fight. This battle lasted three hours after which the pirates boarded.